Massage therapy is an effective method for helping muscle spasm and pain improve. Our chiropractic office has massage therapists in North Wales PA which can help work out stiff muscles and help your chiropractic program improve. During your initial visit, Dr.Allen Conrad will evaluate your specific condition, and incorporate which areas can benefit from chiropractic massage. This diagnosis will be implemented into your care plan, and then we will decide which type of massage is good for your specific condition. Various types of massage therapy include Swedish massage, trigger point massage, petrissage and effleurage. Each type of massage will depend on the area that is injured, and your type of treatment will have goals of improving your injury and helping you return to daily activities as fast as safe and possible. We have found that the combination of chiropractic adjustments, massage therapy and therapeutic exercise is an effective combination for most muscle and tendon injuries, and this type of alternative care plan has seen a lot of success in our practice for patients in the Montgomery County area. The doctor will place you on a treatment plan which usually includes chiropractic care, massage therapy, therapeutic exercises, and home exercises and stretches to be performed. Your doctor will instruct the massage therapist which type of massage is appropriate for your condition, and your care plan will be re-evaluated every 8 visits as needed to determine if any updates to the treatment plan are appropriate. The benefits of massage therapy may include reduced pain, improved flexibility, and an overall feeling of less stress. Common responses from patients who receive chiropractic care and massage therapy include better range of motion, improved pain, and less spasm doing daily activities. On your follow up visit with the doctor, they will discuss how you felt following your initial visit, and determine which course of action is necessary for your future treatments. Do you suffer from stress? Do you get spasm and referral headaches after a long day at the office? Our combination of massage and chiropractic care may be exactly what you need to get your way back on a healthy path. 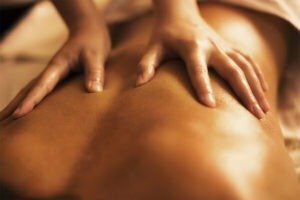 Massage therapy is an effective method of treatment for muscle and joint pain, and if you suffer from back or neck pain, you should schedule an evaluation with our office today to determine which type of treatment would be most effective for your condition.